Ofcom has fined Royal Mail £50,000,000 for a serious breach of competition law, after the company abused its dominant position by discriminating against its only major competitor delivering letters. The penalty is the result of an investigation into a complaint, made to Ofcom by Whistl (one of Royal Mail’s wholesale customers). The complaint was about changes Royal Mail made to its wholesale customers' contracts in early 2014, including wholesale price increases it was introducing. At the time, Whistl was expanding its business to compete directly with Royal Mail by delivering business letters (known as ‘bulk mail’) to addresses in certain parts of the UK – becoming the first company to challenge Royal Mail’s monopoly in the large-scale delivery of bulk mail. The 2014 wholesale price increases meant that any of Royal Mail’s wholesale customers seeking to compete with it by delivering letters in some parts of the country, as Whistl was, would have to pay higher prices in the remaining areas – where it used Royal Mail for delivery. Following notification of these new prices, Whistl suspended plans to extend delivery services to new areas. Our investigation has found Royal Mail’s actions amounted to anti-competitive discrimination against customers, such as Whistl, who sought to deliver bulk mail. Jonathan Oxley, Ofcom’s Competition Group Director, said: “Royal Mail broke the law by abusing its dominant position in bulk mail delivery. In January 2014, Royal Mail issued contractual notices to change its wholesale prices for other postal operators to access its delivery network. 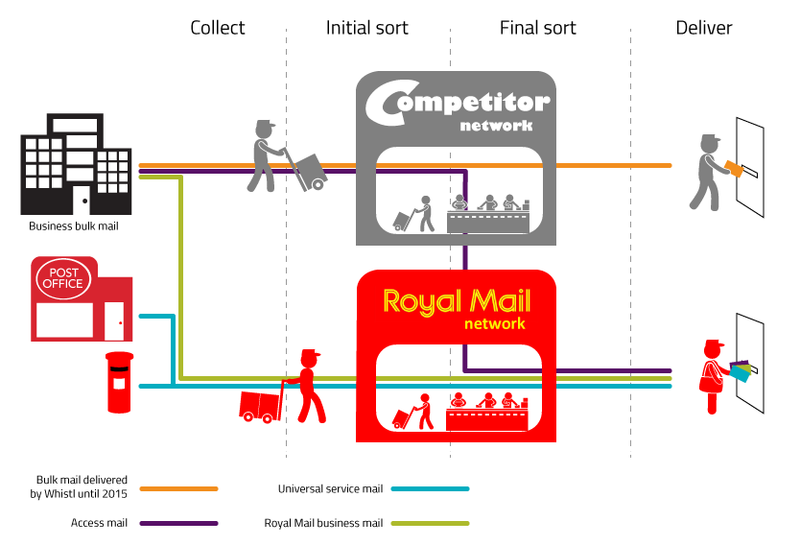 These services, known as ‘access mail’, are worth £1.5bn to Royal Mail each year. They involve access operators such as Whistl collecting and sorting bulk mail from large organisations – such as bank statements, utility bills and information from councils – before handing mail over to Royal Mail to complete delivery. Any company wishing to collect bulk mail has no choice but to use Royal Mail’s access mail services to deliver a large proportion of those letters. Royal Mail’s 2014 price changes involved different price plans for wholesale customers, depending on whether they were able to hit mail volume targets for areas covering the whole of the UK. In practice, if a company wished to start delivering bulk mail in some parts of the country, as Whistl did, it would have to pay Royal Mail around 0.25p (1.2%) more per letter than companies that used Royal Mail to deliver across the whole UK. In this way, Royal Mail sought to charge higher prices for the same services. Whistl complained to Ofcom that Royal Mail’s price changes were unlawful, and in February 2014 we opened an investigation under the Competition Act 1998. Royal Mail’s notified price changes discriminated against its competitors in bulk mail delivery. In effect, Royal Mail used its position as a near-monopoly provider of delivery services to penalise any wholesale customer that sought to compete with it in bulk mail delivery. Royal Mail’s conduct was reasonably likely to put other companies at a competitive disadvantage, and restrict competition from the moment the price changes were notified. The price difference between the price plans would have had a material impact on a delivery competitor’s profits, making it significantly harder for new companies to enter the bulk mail delivery market. As part of our investigation, we analysed Royal Mail’s internal documents regarding the price changes. These show the changes were part of a deliberate strategy to limit competition in delivery as a direct response to the threat of competition from Whistl. Ofcom has therefore found Royal Mail in breach of Section 18 of the Competition Act and Article 102 of the Treaty for the Functioning of the European Union, which prohibits a firm from abusing its dominant position. As a result of this infringement, we have imposed a penalty of £50,000,000. Whistl (formerly TNT Post) began delivering bulk mail in London in 2012. The company planned to grow its delivery operation to cover around 40% of all UK addresses by 2018. While building its new delivery network, Whistl continued to need Royal Mail to deliver letters, but only in those parts of the UK where it was not rolling out its own delivery operations. Whistl subsequently exited the bulk mail delivery market in June 2015. Source: Ofcom’s 2016-17 monitoring update on the postal market (PDF, 1.9 MB), figure 5.2. In 2014, Royal Mail delivered approximately 13 billion letters and large letters. Of these, the vast majority fell into the ‘bulk mail’ category. The largest active bulk mail operator in the UK is Whistl, which in 2014 handled nearly four billion letters. Following our decision to open an investigation, Royal Mail suspended the implementation of a number of the notified price changes, due to a contractual requirement to suspend any changes in the event of a regulatory investigation. At the same time, Ofcom announced a review of the regulatory framework for access pricing, due to our competition concerns, and to ensure that access prices were appropriately set in future.